Flexion / Distraction is a gentle chiropractic adjusting technique procedure for back pain. This procedure was first introduced and developed by Chiropractors more than 40 years ago. In our clinic we use a motorized Leander table (pictured below) to provide continuous passive motion to the area of the back we are isolating and treating. Flexion / Distraction is a safe alternative to back surgery. Along with other chiropractic manipulations, this technique is effective in relieving pain from bulging discs, herniated disc, ruptured discs, failed back surgery syndromes, leg pain, sciatica, slipped discs, facet syndrome, spondylolisthesis, transitional segment, rib subluxations, thoracic spine pain, scoliosis, sprain/strain, disc prolapse, etc. Severe, acute back pain and spinal pain, as well as less severe, chronic back pain can be effectively treated. In the past 10 years, there has been much research into the cause of, and treatment of disk injuries. The results of this research strongly favor conservative treatment of disk injuries over surgery. Chiropractic has been shown time and again to be the most effective form of conservative treatment. Neck pain is now pandemic in the modern world. Who hasn't heard of someone having a stiff neck at the end of the day, pain and/or numbness/pins and neddles down the arm (often the right arm)? One of the most common cause for this is that we sit most of the time with our heads down. When we look at an x-ray of anyone who has a desk job, (and worsened by the increasing use of smartphones and a poor ergonomic) they usually have lost the normal curve in the cervical spine, which is essential for spinal health. This curve allows the neck to flex, and absorb shocks, like a spring. When the curve is lost, the muscles in the back of the neck and upper shoulders are pulled taunt. They become chronically inflamed. Since the bones cannot flex, they begin to degenerate, and the disks between begin to break down, bulge, and eventually rupture (slipped disk). 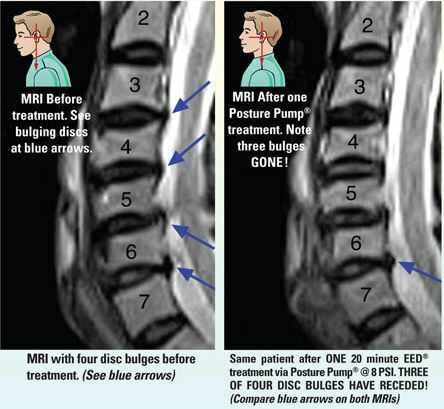 World-renowned neurosurgeon and researcher Dr. C. Norman Shealy demonstrated in multiple MRI studies that Pos­ture Pump decreases disc bulges and spinal cord indenta­tions while enhancing the lordotic curves and spinal ranges of motion. If the spine loses its curved shape, the discs are compressed and rich lubricating fluid is unable to penetrate. This causes premature aging in the form of stiff dry joints and then degeneration. Posture Pump decompresses and hydrates damaged discs while aligning vertebra into their natural curved shape. This is a vast improvement over common linear traction where the natural curved shape is forcefully removed! Expansion and contraction of three individual air cells (man­ually inflated) is employed with a rocking motion to create alternating hydration and milking of the discs. Longer expansion periods are employed for posture restoration. In our clinic we use it along with chiropractic adjustments, myofascial needling technique, and physical therapy modalities, to stop the degenerative process and achieve a long-term cure to your neck, shoulder, and headache pain. We will spend some time explaining as well the importance of a good posture, ergonomic and exercise.